Continuing on our recap series of The Game of Thrones, we are reaching near- Things are about to get really serious really fast. Read on and jog your memory. It’s nothing short of a thrill just writing this, I am sure you readers are enjoying it so far. We all cannot wait for the final season. So starting off with Season 3. Family drama ensues among the Lannisters and Tywin blames Tyrion for his mother’s death who died giving birth to him. Tywin demotes him from Hand of The King position and forces Tyrion to marry Sansa. 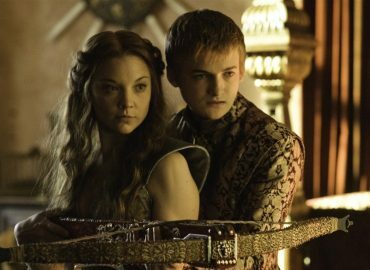 Meanwhile, Sadistic Joffrey is engaged to Margaery Tyrell (Renly’s Widow), in hopes of strengthening the ties between the two houses; Lannisters and Tyrells. Tywin also keeps himself busy in the Kings Landing writing letters to Roose Bolton and Walder Frey, offering them titles so he can set the stage for the Red Wedding. Jon Snow beyond the Wall meets the Wildling Leader Mance Rayder, who tells Jon about the hell that the white walkers are about to unleash on humanity and it will a losing battle. Robb instead of working on forming alliances and marrying Roslin Frey, decides against it, as he has fallen in love with a healer – Talisa. Nevertheless, the Starks are invited to her wedding to another and this is where the most unexpected shocking turn of the Game of Thrones season 3 takes place. 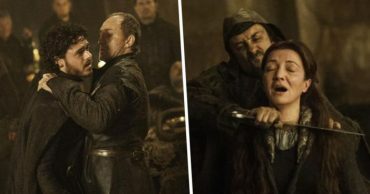 Roslin’s resentful father Lord Walder Frey had different plans for her daughter’s reception and with an added fire by the Lannisters, Robb Stark, Catelyn and along with all the bannermen are slaughtered like animals, including Robb Stark’s heavily pregnant wife, Talisa. 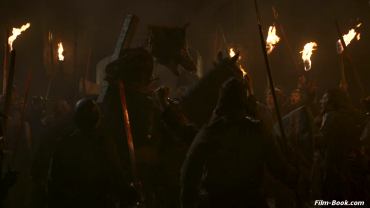 The beheaded, dead body of Robb Stark is paraded with his wolf’s head on top of his lifeless body while the soldiers chant “Here comes The King in The North” as Arya watches teary-eyed. Soon ‘The Hound’ escapes with her and she finds a companion and protector in her. Roose Bolton, the backstabbing betrayer who was Robb Stark’s top general was promoted to Warden of the North after his successful part in The Red Wedding massacre. 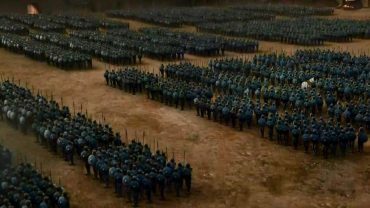 Daenerys gathers her unsullied army of 8000 in the east and ships. Brienne and Jaime continue their journey south towards the King’s Landing. Somewhere, Bran Stark discovers he can project himself into the body of a dire wolf. 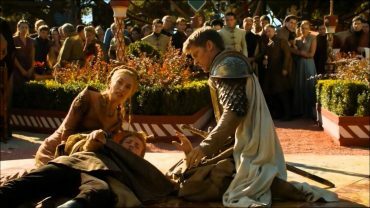 Joffery is poisoned at his own wedding with Margaery when he drinks his poisoned wine. 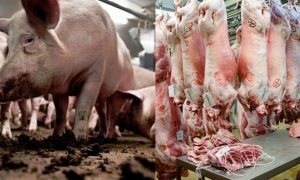 The scene is pretty gruesome for a poisoned death scene but satisfying nonetheless. Little finger helps Sansa escape and smuggle her out of the King’s Landing and safely to her aunt Lysa Arryn. Lysa proves to be mad and tries to kill Sansa by pushing her through the moon door at The Vale and hopes to marry Little Finger but is pushed into it instead by Baelish, himself. His motive was to take over Vale and so he does becoming ‘Lord Protector of the Vale’. Jamie and Brienne arrive at the King’s Landing only to find Sansa has escaped. Brienne is then tasked to track her down. Cersei blames Tyrion for her son’s assassination and gets him imprisoned. 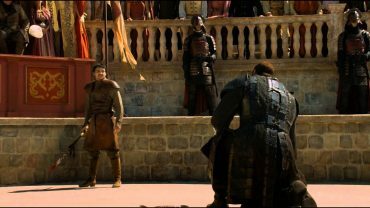 A trial by combat happens and this time it’s Oberyn Martell fighting for him and is defeated which sends Tyrion back in imprisonment. 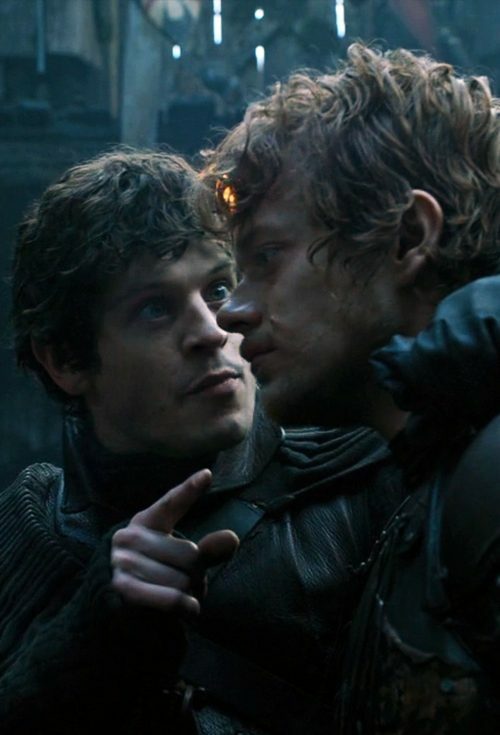 Jamie frees Tyrion who finds his father in bed with his lover Shae- he later kills his father Tywin with a crossbow across his forehead and leaves King’s Landing. 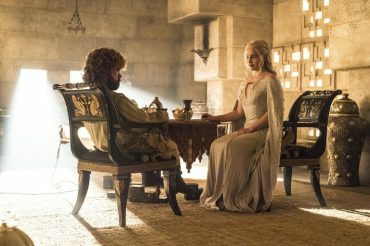 Tyrion seeks Daenerys, who he believes can defeat Cersei. Roose Bolton returns to Winterfell to find his illegitimate son Ramsay has tortured Theon beyond belief. 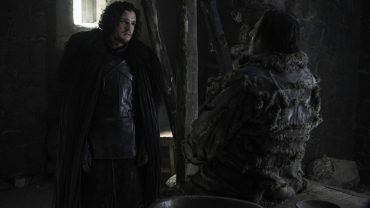 In the North, Jon Snow has returned from the Wildlings camp and notifies the watch with Mance Rayder’s advancing forces. Stannis along with what is left of his army come to rescue. Brienne meets The Hound and Arya, where she tries to convince her to return with her as she has sworn to her mother Catelyn. Arya refuses and the Hound gets into a battle with Brienne and loses. Arya leaves him and runs away to study under Jaqan H’ghar at the House of Black and White in Braavos. Stannis defeats Rayder but the Wildlings refuse to join forces with him. Snow is chosen as the leader of the Night’s Watch. The witch Lady Melisandre convinces Stannis to sacrifice his daughter to ‘Lord of Light’ and he burns her alive, losing his troops respect. 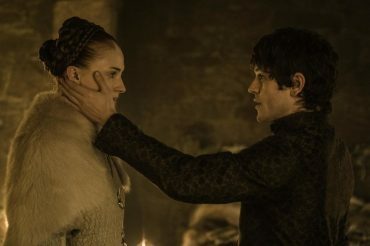 Littlefinger brings Sansa to Ramsay Bolton, so they can get married and this might bring the Starks back to Winterfell. Stannis arrives at Winterfell, fights the Boltons, loses and perishes at the hands of Brienne – Who has come this far in search of Sansa Stark. Melisandre escapes to Castle Black. Sansa manages to escape from Ramsay. Cercie plans against her daughter-in-law, now married to her younger son King Tommen. Later weaponizing the High Sparrow, Cersei does the walk of shame after her sexual hypocrisy is exposed, as she confesses to adultery with her cousin Lancel. Daenerys, on the other hand, takes over city Mereen where an uprising takes place against her. While her guards are in a battle with the anonymous risers known as the Sons of the Harpy. One of her dragons whisks her away and into a Dothraki horde, that then make her a captive and march her to their Khal. Tyrion meets Daenerys and gains her favor, so much so she leaves him in charge when she isn’t around. 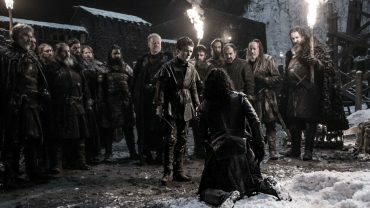 Jon Snow along with a group of Night’s Watchmen accompanying him set out to meet the Wildlings to seek their alliance. 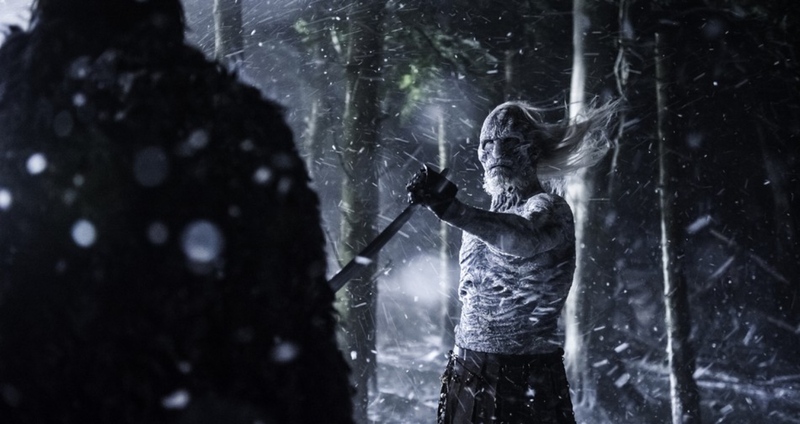 As negotiations are underway, The Night King and his walker army attack the Wildlings, turning them into the white walkers as Jon watches in horror and manages to escape. Upon returning the Wall, Jon is lured in and killed by mutineers.